Farms are hard work. Labor is scarce at harvest-time. What's a hacker/farmer to do? 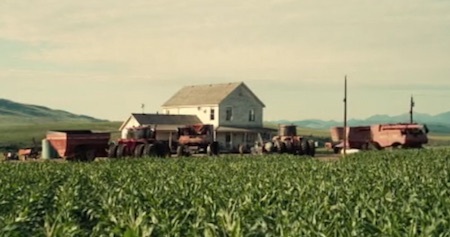 Science fiction fans at the movies are ready with their favorite example of autonomous combines - the ones in the recent 2015 hit movie Interstellar. Science fiction fans down on the farm of course recall the robomule that pulled the plough in Harry Harrison's 1965 novel Bill the Galactic Hero. Update 02-June-2016: Take a look at another reference, the self-guided tractor from At the Bottom of a Hole (1966), by Larry Niven.